Plato made a solid getaway and defended into Redgate from the fast-starting BMW of Colin Turkington. Plato had said yesterday ‘it’d take a brave man to go around the outside of me at turn one’ and so it proved as Turkington decided discretion was the better part of valour and settled into second. Gordon Shedden was shuffled down to fourth at the start as Tordoff also sneaked by the Honda Civic Tourer. The Scotsman responded well, however, as he jumped back up to third by the end of lap one as Turkington struggled for pace in the early stages. Hunter Abbott and Warren Scott’s race was over before it had barely started after contact at the Craner Curves left the Audi A4 and Vauxhall Insignia stricken in the gravel. The BMW of Nick Foster also slid wide in the slippery conditions but recovered at the rear of the field. Contact at the same part of the circuit followed a lap later between the WIX Racing Mercedes of Adam Morgan and Dave Newsham’s AmDTuning.com Ford Focus. The incident forced the latter into spin but Newsham went on to produce a sensational fight back through the field. Meanwhile the ballast-laden Honda Civic of Andy Jordan was busy making progress, passing Aron Smith’s VW for fifth on lap five. Smith had been further relegated down the order before the end of the lap as the CC began to stutter on its Dunlop wet tyres. Rob Austin was languishing down the order and decided to take a gamble by pitting to switch to soft tyres. The Audi A4 driver went on to record the fastest lap of the race and with it scoring a championship point but it was too late to make any real headway. Turkington began to find front-running pace by mid-distance as he got back by Shedden, but it was his eBay Motors team-mate Rob Collard making a real move through the pack. Starting down in 13th Collard took fifth on the seventh tour after also getting past Shedden’s Tourer. He didn’t stop there, however, after latching on to a podium battle between Turkington and Jordan. 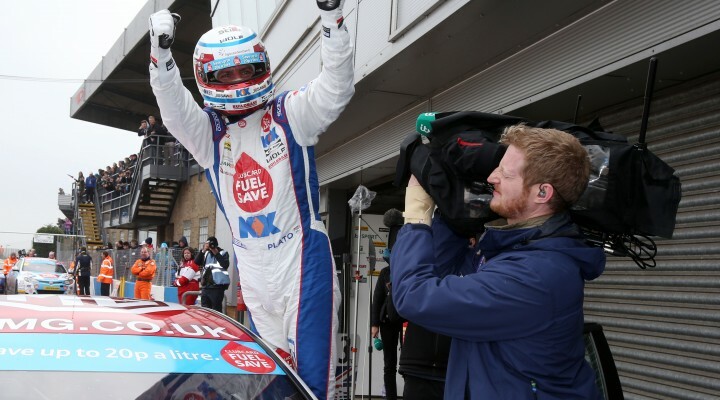 Pirtek Racing’s Jordan produced a great move on Turkington at Redgate to take third and Collard made the most of his team-mates misfortune by also passing the Ulsterman shortly after. There was some enthralling action towards the lower end of the top ten and beyond. Airwaves Racing’s Fabrizio Giovanardi got the better of his old rival Matt Neal, with the Civic Tourer seemingly lacking the ultimate pace in tricky conditions. Smith held on to ninth ahead of a gaggle of cars fighting it out for a top ten finish. It was Tom Ingram’s Toyota that came out on top with just over a second covering him and the MG of Marc Hynes, the recovering Newsham and a rather frustrated Alain Menu. The Swiss driver had started the contest from the third row but endured a torrid opening lap where he tumbled down the order and he was unable to respond in his VW during the 16 laps of running. United Autosports suffered late heartache with both of its drivers being involved in separate incidents. Glynn Geddie had run as high as 11th but was hit by the Mercedes of Morgan on the final tour of the 1.96 mile circuit, whilst James Cole was fired off by Ollie Jackson’s Proton at the Old Hairpin. Jackson’s team-mate Dan Welch enjoyed a solid first outing of the season, completing all 16-laps and producing much improved one-lap pace. He would eventually finish just outside the top 20. There was little doubting the cream of the crop, however, and that was Plato and his MG team-mate Tordoff who had both scuppered off into the distance to score the first one-two finish of the BTCC season. Race two will take place at 14:30 with all the action being screened live and exclusively on ITV4.